East Stroudsburg, PA − September 27, 2018 − East Stroudsburg University of Pennsylvania announced the selection of its 2018 Legislative Fellow, State Senator Judith L. Schwank, at a breakfast held in her honor on Thursday, September 27. ESU President Marcia G. Welsh, Ph.D., introduced Senator Schwank at the event to university faculty, students, staff and special guests from the community. 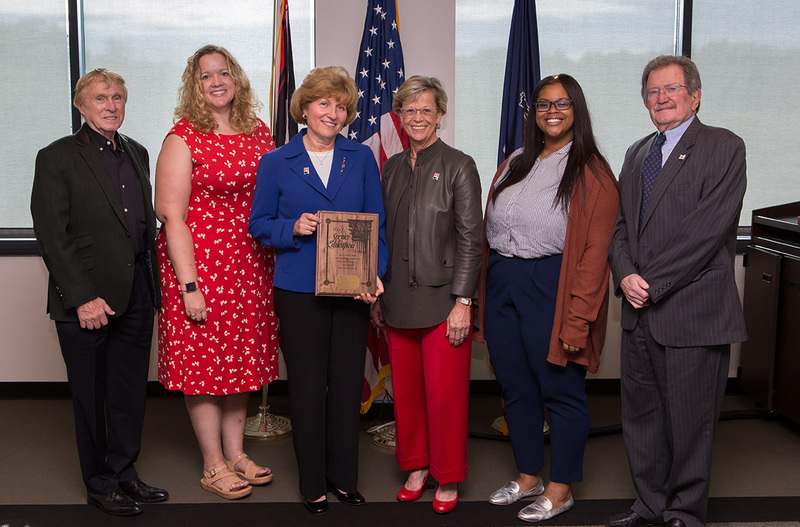 Pictured from left to right: ESU Council of Trustees member, Bruno Klaus; Professor of communication and member of the Legislative Fellow Committee, Andrea McClanahan, Ph.D.; ESU 2018 Legislative Fellow, State Senator Judith L. Schwank, ESU President, Marcia G. Welsh, Ph.D.; Student Senate President, Judaha Amoroso; ESU Council of Trustees Chair, Patrick Ross ’67. The Legislative Fellow program, established in 1999, is designed to bring state legislators to campus to participate in a variety of campus activities and to meet formally and informally with students, faculty and staff throughout the year. As part of the program, ESU Legislative Fellows may also request a student intern. The program is co-sponsored by the university administration and the local chapter of the Association of Pennsylvania State College and University Faculties (APSCUF). Fellows are selected by a committee of faculty and administrators, and jointly appointed by the university president and the president of APSCUF at the beginning of each academic year. Senator Schwank was elected to represent the 11th Senatorial District in a 2011 special election. She was re-elected in 2012 and 2016. She serves as the democratic chair of the Agriculture and Rural Affairs Committee and the Health and Human Services Committee, and democratic vice chair of the Appropriations Committee. She also serves on the Aging and Youth, Local Government, State Government, and Policy Committees. Senator Schwank has also been appointed by Senate leadership to the Board of Governors of Pennsylvania’s State System of Higher Education and the Pennsylvania Interbranch Commission for Gender, Racial, and Ethnic Fairness. Schwank earned a bachelor’s degree and a master’s degree in agricultural education from Penn State University. After college, she worked as a Berks County horticultural agent for Penn State Cooperative Extension and established the Master Gardener Program. She became director of the Berks County Cooperative Extension Program in 1991 and was elected as the first female Berks County Commissioner in 2000. Schwank serves as president of 10,000 Friends and is a member of the board of directors for Girl Scouts of Southeast Pennsylvania She also served as Dean of Agricultural and Environmental Sciences at Delaware Valley College. Senator Schwank resides in Reading, Pa. with her husband, Jim. She is the proud parent of three children and has four grandchildren. For more information on the Legislative Fellow program, contact Miguel Barbosa, chief of staff in ESU’s Office of the President at 570-422-3545.